Although things have been quiet here on the blog, in real life it's been anything but quiet; isn't that always the way of things at school year's end? 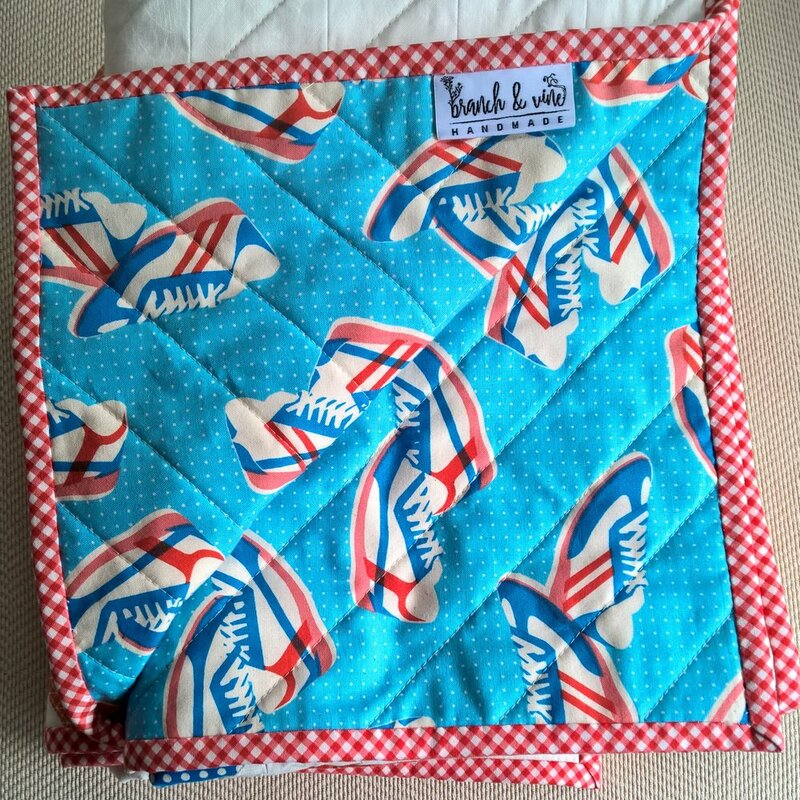 Between band concerts, cross country meets, birthdays, visits, BBQs, yadda-yadda-yadda, I finally managed to snap a few good photos and carve out some time to share with you my latest quilt finish: Meet "Kicks"! Special thanks to darling daughter for holding the quilt for a photo op! - Constructed in patchwork of squares & HST that finish at 2"
I'm really thrilled with how this quilt turned out! I started with the adorable backing fabric that I snagged on sale from Pink Castle Fabrics a couple of months ago and added in some coordinating prints. Then my lovely stack sat patiently on my shelf giving me some serious side-eye while I toiled away on bags and pouches. Then, of course, they waited a little while longer for inspiration to strike. I let the backing fabric drive my design ideas: I loved how the print reminded me of sneakers from the 70s (Onitsuka Tigers anyone?). Little known fact: I received my undergraduate and graduate degrees in Sport Psychology and my mentor was an Olympics buff, so I definitely felt the graphics of the '76 Montreal Olympic games influencing the direction of my design. So I started sketching. I like to sketch in OneNote in Microsoft's Office 365 suite. This is the sketch from which I based my design and cutting instructions to myself. I rarely work from published patterns; my tendency is to sketch and do my own quilt maths based on the design. The Mr. is a high school math teacher, but I don't usually have to enlist his help too frequently on my quilt math (although his skills have come in handy a time or two for determining how much backing fabric to buy to get a directional print pieced and oriented the same direction)! The backing fabric was the driving force behind all aspects of my design. In fact, I had to do some last minute quilt surgery to take out one row in order to avoid having to add piecing to the backing fabric! 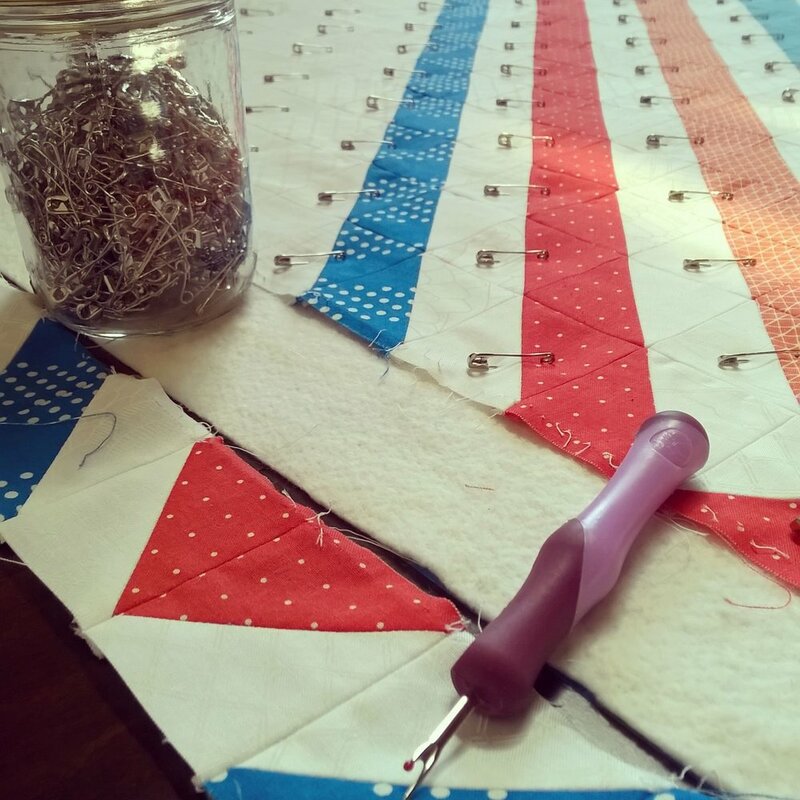 Usually my quilt tops are created with one vision and then I cobble together or purchase backing fabric to complement the top. Creating a top to go with the backing has been an interesting change-of-pace! I love using backgrounds in a mix of low-volume prints, and this quilt was no exception. I used Kona snow and 3 additional white-on-white prints for the background. 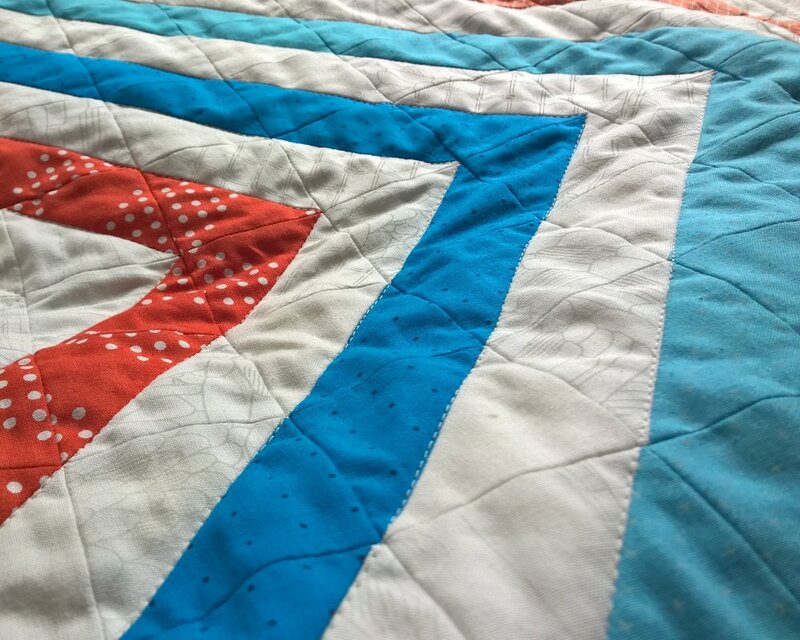 The quilt top is constructed patchwork style with squares and HST that finish at 2". I echo quilted in straight lines in a creamy thread to reinforce the asymmetrical striping. This was such a joy to make from design to finish! If this quilt speaks to you as much as it does to me, I have listed it in my Etsy shop for purchase. Thanks for sharing in my creative journey!